A summary of the proposed role appears below. Unfortunately, as you will see, this is all very complex and so far there is still no agreement on how all of the possible interplays between microbes may lead to rosacea being present. For more information on this paper. Step 1: Unaffected rosacea-prone skin has increased expression of microbe sensing machinery and normal flora. Step 2: Commensal agents may act as trigger factors for rosacea inflammation through activation of pattern recognition receptors (PRR) or altered tolerance. Step 4: Alterations in commensal flora or introduction of noncommensal agents may result in further activation of inflammatory pathways, worsening of disease, or appearance of subtype-specific symptoms. Step 5: An immune response that results in clearance of the exacerbating agent may impart temporary relief from rosacea symptoms and a return to microbial homeostasis. AMP, Antimicrobial peptide. exception of Demodex and H pylori, the association of rosacea and microorganisms is supported by limited, small, and underpowered studies. J Am Acad Dermatol 2013;69:1025-32. From Galderma Laboratories LP. Funding provided by Galderma Laboratories LP, Fort Worth, TX. Rosacea is a skin condition of abnormal inflammation and vascular dysfunction. The active contribution of a microbial agent in the development or progression of rosacea continues to be debated. Research supports the presence of commensal Demodex folliculorum mites at increased density in the skin and associates Helicobacter pylori infection of the gut with rosacea. Fewer studies implicate Staphylococcus epidermidis, Chlamydophila pneumoniae, and the Demodex-associated bacteria Bacillus oleronius. No research, however, provides a mechanism by which colonization by a microorganism translates to manifestation of the condition. Prevailing and emerging principles in the biology of the microbiome and the pathophysiology of rosacea may help to reconcile these lingering questions. 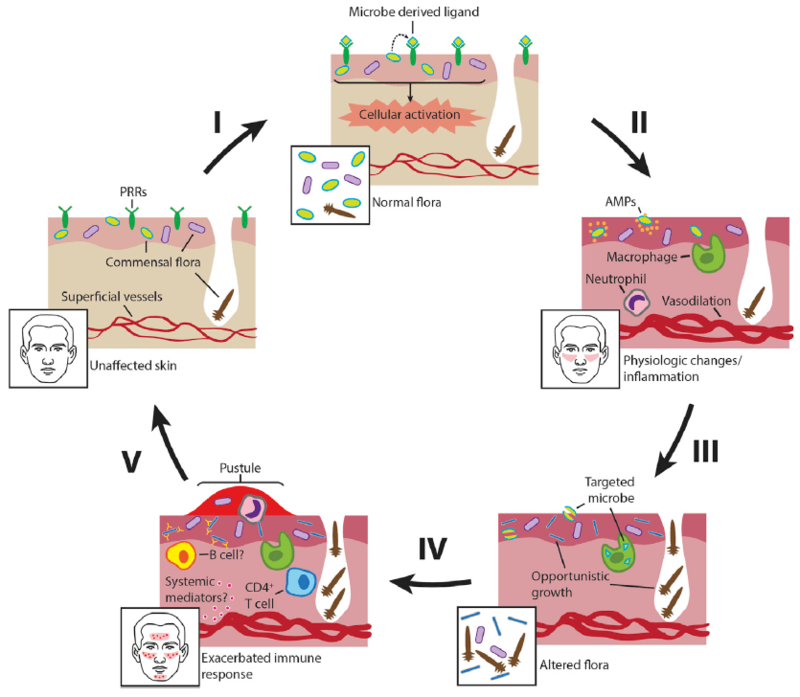 Here the microorganisms implicated in rosacea are reviewed and the reaction of the microbiome to inflammation and to changes in microenvironments and macroenvironments are discussed to explain potential roles for microorganisms in rosacea pathophysiology. A Papule is a Gravestone for a Dead Demodex! What role do micro-organisms in play in Rosacea? Read more about: Demodex Mites, What Causes Rosacea? “Oh my goodness my ears went up when mention of Chlamydophila pneumonia was made. Given the high incidence of asthma in rosacea subjects it is very plausible. I have considered the treatment recommendations of a Dr. David Hahn who recommends long term antibiotic prescription for this. I hesitated to try, but am increasingly giving it consideration. He wrote a book The Asthma Cure. I suffer from both maladies intermittently. Not quite right ever though! Great article David Pascoe. Why does the Canadian Medical Association not recognize Demodex as a condition to be treated?